Fall Startup took place on October 6th, 2016. It was held at high schools across the nation. 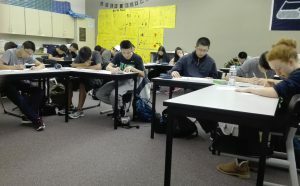 This competition, catered mostly towards grades 9-12, focused on speed; competitors were given 30 minutes to answer as many of the 100 problems on the test as they could. Most of the problems were straightforward and basic competition-style questions, and the categories covered by these problems included arithmetic, geometry, probability, and counting. Awards were given to the top scoring participants in each grade. Additionally, schools with the highest-scoring participants were honored. I found that a good strategy on this test was to scan through the whole test and do all of the easy, straightfoward problems first. Then, I’d go back and focus on the harder problems. By doing it this way, it’s ensured that you get a chance to do all the easy problems before running out of time, as each problem is worth the same amount of points, regardless of difficulty. Fall Startup marks the beginning of the math competition season! Unfortunately, the math competition in Blaine for high schoolers got cancelled this year, but there are still many other opportunities to showcase your math skills in the upcoming months. The Math is Cool (MIC) math competition comes shortly afterwards (October 22), followed by Fall Classic (November 12th). For more information on upcoming math competitions and events, check out WSMA’s test hub.